Students wrapped up their media projects, waved goodbye to their home stay hosts and boarded a bus bound for Bradford. We passed by fields of green and gold with sheep and horses dotting the idyllic landscape. Some students had never seen sheep before and were excited by the sight. The group arrived at the Hotel Dubrovnik, home base for the next four days, and was greeted by our friendly and energetic hosts, Naz and Nicole. Both are youth workers and they quickly integrated us into their current projects focusing on diversity and inclusion. During our first afternoon, we traveled to Shipley for a mixture of media work, community engagement and tourism. The students broke into groups, with some staying in town to interview Shipley residents about community improvement projects and others exploring Saltaire, a small village and UNESCO World Heritage Site on the site of the former Salts Mill. Sir Titus Salt owned the mill, houses and shops in the town and mill workers were required to live there. He also built a park for the workers and provided free healthcare. Students had some downtime to unpack at the hotel, but many opted to head to Lister Park with the coordinator to participate in an inclusion bike ride. This event is held every last Thursday of the month and provides a range of bikes for young people of all developmental abilities. Some Experimenters tried their hand at a bicycle which uses arm pedals for use by people in wheelchairs. After a busy first day jumping right into Bradford politics, students headed back to the hotel for a relaxing pizza night. The next day, students had the opportunity to meet with several prominent Bradford city council officials to discuss issues regarding communication, development, policing and education. For example, two students attended a meeting with local officials to discuss the Future Safe program, which combines the efforts of youth organizations and police to prevent radicalization, while two students were interviewed live on public radio. We spent the afternoon at the National Science and Media Museum, turning ourselves into sports broadcasters and animated figures. 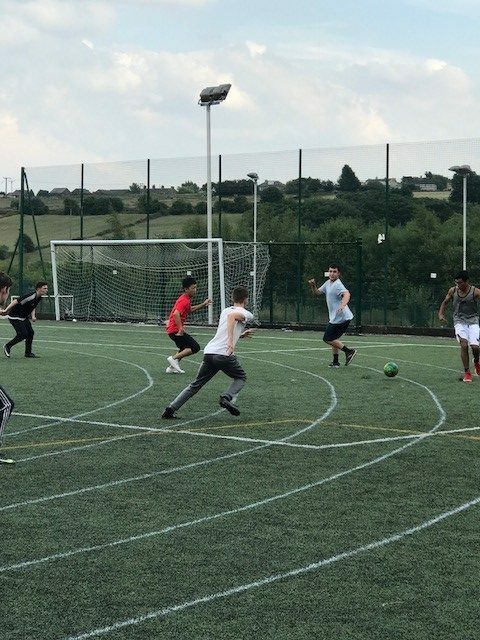 Keeping with the theme of sport, students joined the local youth club to play a game of soccer and rounders, a popular English sport which is a mixture of cricket and baseball. Our third day in Bradford began with a moving and informative tour along the Mile of Tolerance. We visited a Sikh and Hindu temple and a mosque, observing religious rituals and learning about the importance of faith and community in Bradford. Students were able to ask questions about the various religious beliefs and frame them within a context of media and representation within society. We were generously fed and welcomed everywhere we went. After the Mile of Tolerance, students broke into two groups, with one group going to Leeds and the other traveling to the Bronte sisters’ parsonage in Hawthorne village. 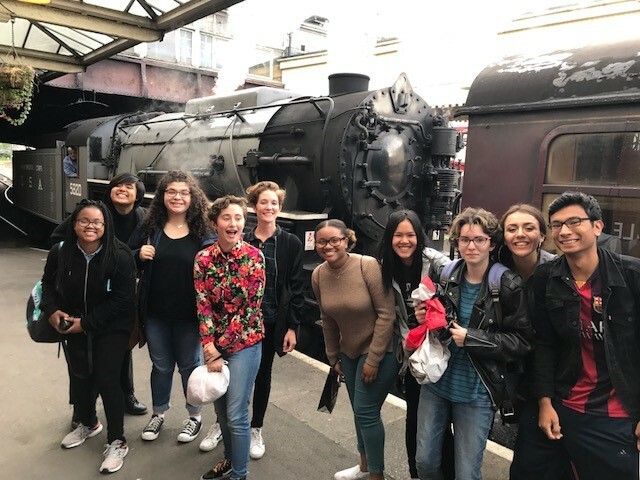 The Leeds group explored the city center and stumbled upon a cat cafe, while the Hawthorne group took a steam engine train to a picturesque village high in the moors. The evening concluded with a traditional meal of fish and chips. As every local resident commented, Bradford had been experiencing an abundance of sunshine and heat. We finally experienced typical English summer weather when our cricket game, planned for our last day in Bradford, was called off on account of the rain. We made an indoor day of it and headed off to Cineworld to see Incredibles 2. The day concluded with a trip to an enormous Indian buffet where we ate until we couldn’t eat anymore! We woke up early to participate in an animation workshop led by an award-winning animator. 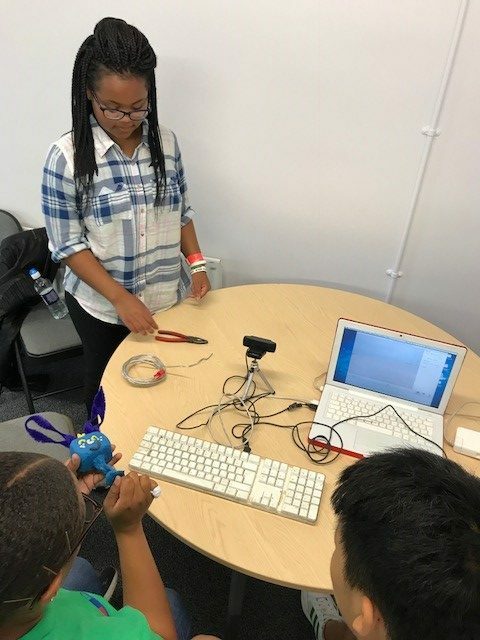 Students learned the basics of drawing, character development and stop-motion computer animation using clay figures. Students produced amazing videos and storylines within a couple of hours. Everyone got together to sing happy birthday to student Karina before hopping on the bus for a four-hour ride to our final stop on the program. We all were sad to leave Bradford, but Worcester was waiting for us!